This chapter will discuss the implementation of a suite of PebblePad activities and assessment tasks across the Bachelor of Science Advanced (Honours) undergraduate degree program. Enrolled in this program are students who scored in the top 11 percentile of all university entrants and are intentionally on a scientific research career trajectory. In preparation for the embedded honour component of the program, students undertake three core research project courses across the second and third academic year levels, each designed to develop an array of different research capabilities within a student’s specific discipline. In these courses, students complete many traditional communication methods practiced by scientists. In the past, there has been limited focus on a key component of scientific process, the contextual reflection on the undertaking of scientific research. The PebblePad platform is a flexible tool that provides an opportunity to augment the existing research experiences through the development of scaffolded critical reflection of scientific practices holistically. This chapter will present the application of best practices associated with both blended design and undergraduate research experiences. It will explore the benefits of this combination and how to successfully enhance a critical component of developing the next generation of scientists using best practice blended learning design strategies. We would like to acknowledge the significant support in the refinement and implementation of this project provided by the Griffith Sciences Blended Learning team, Christopher Allan and David Green; Curriculum Consultant Julie Crough; and Employability Curriculum Consultant Gayle Brent. Alammary, A., Sheard, J., & Carbone, A. (2014). 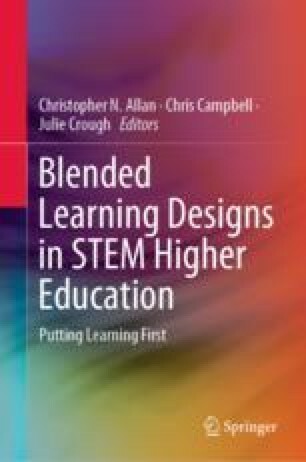 Blended learning in higher education: Three different design approaches. Australasian Journal of Educational Technology, 30(4). https://doi.org/10.14742/ajet.693. Gregory, M. S.-J., & Lodge, J. M. (2015). Academic workload: The silent barrier to the implementation of technology-enhanced learning strategies in higher education. Distance Education, 197–210. https://doi.org/10.1080/01587919.2015.1055056. Healey, M., & Jenkins, A. (2009). Developing undergraduate research and inquiry. York, UK: Higher Education Academy. Retrieved November 7, 2018, from https://www.heacademy.ac.uk/node/17083. Jones, S., & Yates, B. (2011). Learning and Teaching academic standards project—Science. Strawberry Hills, NSW Retrieved from http://www.acds-tlcc.edu.au/wp-content/uploads/sites/14/2016/11/altc_standards_SCIENCE_240811_v3-1.pdf. Wisker, G. (2017). Frameworks and Freedoms: Supervising the Undergraduate Dissertation. Paper presented at the International Conference on Models of Engaged Learning and Teaching (I-MELT), Adelaide, South Australia. www.imelt.edu.au.